This weekend our complete set up of Geraniums will be ready for browsing in selling section B. Easily one of the most reliable and versatile plant species there is, offering a long season even in a cooler, wet Fall with very limited pest or disease concerns. The starter shrubs are looking great, as well as the Alstroemeria and Osteospermum. Venus Fly Traps, a shipment of fresh moss, and an additional shipment of seed potatoes have arrived too! Another interspecific series of Geranium is the dark leaved, more compact Caliente series, with new 'White' this season to add to 'Fire', 'Lavender' and 'Orange'. Ivy Geranium 'Focus Red Ice' offers very consistent variegation in the flower, nice zoning on the leaf and has a vigorous growth habit. While 'Precision Burgundy Ice' has incredible contrast between the white and burgundy in the flowers and offers a slightly more compact growing habit. The Fantasia series is remarkable for a darker leafed, medium growing, sturdy stemmed choice. Standout in this series are Fantasia 'Strawberry Sizzle', 'Cranberry Sizzle' and 'Purple Sizzle'. 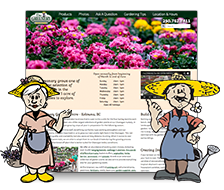 The Big Ezee series has big broad heads of flowers on shorter and wider growth. 'Fuchsia Blue','Dark Red', 'Neon', and 'Pink' complete the selection. Be sure to check out this red as we think it is truly the brightest true red colour we have ever seen in a geranium. Exotic geraniums have some real appeal with their unique leaf colouring and zoning. Our #1 selling Exotic Geranium, Crystal Palace boasts beautiful three toned leaves of chartreuse, mid-green and dark green and beautiful, bright orange, single blooms. On the Scented Geranium tables, look for some trusted returnees such as 'Citronella', 'Chocolate', 'Pink Capitatum', 'Lemon Fizz', and 'Quercifolia' (Wasp Shocker). While our starter size shrubs from Van Belle Nursery have been available for the last couple of weeks, some other varieties that have just been potted up are now available as well. Van Belle, located in Abbotsford, BC is also a family business that has been specializing in growing containerized, cold hardy ornamentals since 1973. 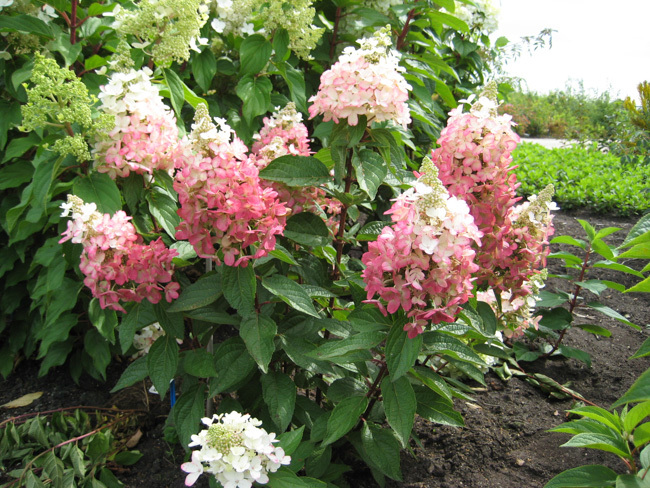 Choose from over 30 different and exciting varieties of Hydrangeas in 4.5" square pots for $7.99 each. Like last season, we will have the Everlasting series including Amethyst, Garnet, Harmony, Jade and Noblesse. 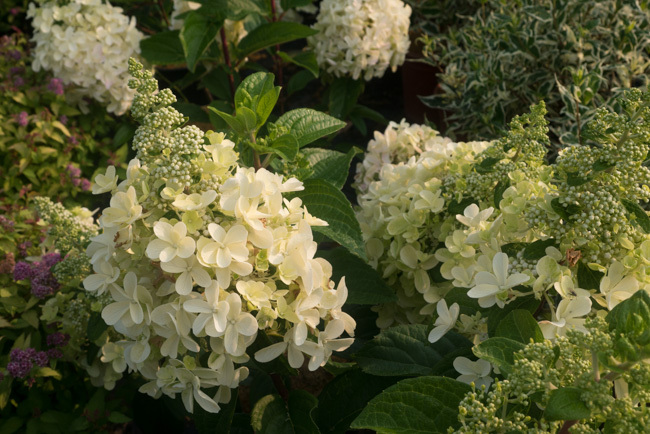 Returning this season in the hardy paniculata type Hydrangeas is the Lavalamp series, including Candelabra, Flare, and Moonrock. 'Inspire'- truly unique, full mophead blooms that are made up of flowers that look like stars! The flowers will start out small and chartreuse in colour and then transition to giant pink or purple beautiful specimens. 'Love'- sweet, baby pink doubled rosettes with yellow centres will mature to a dark pink mop head later in the summer, offers a long bloomtime, blooming on old and new wood! 'Miss Saori'- giant flowers consist of hundreds of white heart-shaped petals that are edged in red creating a very doubled and sweet look over burgundy foliage in spring and fall. Well branched, fast growing, reblooming and blooming on old and new wood! 'Onyx Peacock'- prolific, giant pink, blue and purple flowers throughout the summer on sturdy BLACK stems! Soil pH will determine the flower colour, more acidic soil brings more blue flowers, fast growing, blooms on old and new wood! Other popular shrubs we have returning this season are Butterfly Bush Flutterby Petite Blue Heaven and Tutti Fruitti Pink, Sambucus Black Lace, Spirea Poprocks Rainbow Fizz, Syringa Scent & Sensibility Pink, Viburnum Summer Snowflake and Weigela Date Night Crimson Kisses. Great for small hedging projects are the Dwarf Boxwood and Berberis (Barberry) Carousel and Sunsation and for a unique ground cover try out the Drift series Roses. 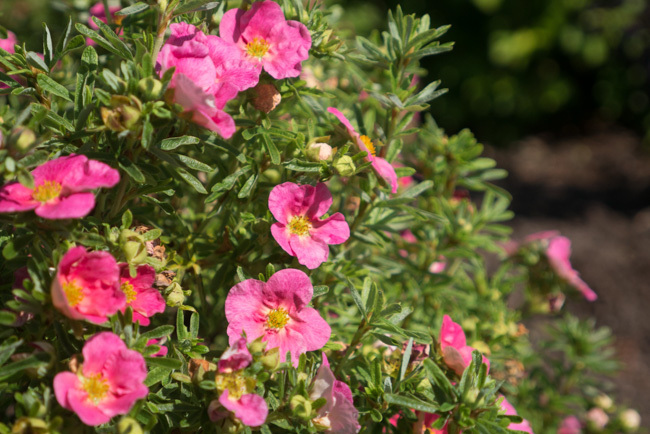 Returning this season are the Bella series Potentilla, offering a tidy growth habit and compact size, with larger flowers with colours that intensify rather than fade. Bella Bellissima has intensely pink blooms from top to bottom and Bella Sol has fiery orange flowers smothering virtually care free shrubs. Come in and check out our selection of Alstroemeria (Princess Lilies) which has been temporarily set up on table B4 for this past week. This stunning, fairly compact Alstroemeria is perfect for the balcony, patio and in the garden and will give you colour all summer long. Choose from the five varieties 'Eliane' (pink), 'Kate' (red), 'Ariane' (yellow), 'Amina' (orange), 'Louise' (purple)and 'Claire' (white). Choose from best sellers such as 'Blue Eyed Beauty' and 'Voltage Yellow', or from the most heat tolerant Serenity 'Lavender Frost'. '4D Sunburst' boasts an improved growth habit and yellow double flowers, and the new 'Margarita Orange Flare' looks really incredible. If you are a fan of 'Blue Eyed Beauty' check out 'Blushing Beauty' this season! This great selection can be found on Tables D11 & D12! Our shipment of Seed Potatoes from Abetkoff Farms in Grand Forks has arrived. There are 5lb bags of Yukon Gold, Warba, Norland and Pontiac as well as others available. Venus Fly Traps & Octopus Plants! Our shipment of 3" Venus Fly Traps and Octopus plants will be arriving! These unique carnivorous plants always create a great conversation. You will find them right up front on table W2. Our shipment of Fresh Moss has arrived! If you can't wait to start planting your moss baskets and other exciting creations, then come on in and get some while it is nice and fresh. Kirsten is VERY excited about our new shipment of Moss!